Eleanor Parker Sapia, the author of A Decent Woman, is honored to participate in an Author Panel titled, Writing Historical Fiction to Reach/Teach New Audiences, with author Dr. Virginia Sanchez-Korrol, moderated by Vanessa Perez-Rosario, and hosted by Center of Puerto Rican Studies at Hunter College, CUNY. The author event will take place on Thursday, October 11 at the Hunter College faculty dining room on the 8th floor from 6-8 pm. The two authors will speak about their books using historical fiction to relate the female narrative in 19th century Puerto Rico. Puerto Rican-born Eleanor Parker Sapia, the author of the multi-award winning novel, A Decent Woman, signed with Winter Goose Publishing in September 2018 to republish her debut novel (with a new book cover!) and to publish her second book, The Laments. She looks forward to working with Jessica Kristie and her team with both books. A Decent Woman is due to hit the book world again by the end of 2018 in paperback and ebook format. The Laments is scheduled for publication in 2019. Eleanor is grateful for this new opportunity and thanks her readers for their continued support! Eleanor Parker Sapia is currently writing her second novel, The Laments, set in 1926 Puerto Rico and Isla de Cabras. A DECENT WOMAN WAS AWARDED SECOND PLACE FOR BEST LATINO FOCUSED FICTION, ENGLISH, AT THE 2017 INTERNATIONAL LATINO BOOK AWARDS. THANK YOU TO MY READERS, THE JUDGES, LATINO LITERACY NOW, COMADRES PARA LAS AMERICAS, AND KIRK WHISLER AND HIS AMAZING STAFF! Eleanor’s historical novel, A DECENT WOMAN, was selected as a Finalist for Best Latino Focused Fiction by the judges of the 2017 International Latino Book Award with Latino Literacy Now and Comadres Para Las Americas! Eleanor will be chatting with novelist/screenwriter and World of Ink host, Marsha Casper Cook, and novelist/short story writer Jack Remick, about telling a good story on March 1, 2017. Please join us! Eleanor is excited and honored to participate in Comite Noviembre’s Puerto Rican Author’s Fifth Annual Book Expo at Eugenio Hostos Community College in the Bronx on November 19, 2016. Please come out and meet Eleanor and the Puerto Rican authors, artists, and artisans, who will offer their books and works for purchase! Author readings from 4-5 pm. Gracias! Eleanor will be reading from and signing copies of A DECENT WOMAN at Four Seasons Books in charming Shepherdstown, West Virginia on Saturday, November 12 at 1 pm. Come on out and meet the author! ** Eleanor attended the fabulous 2016 International Latino Book Awards at USC, Dominguez Hills, CA, and garnered an Honorable Mention in the Historical Fiction, English category! Eleanor’s debut novel, A Decent Woman, is a Finalist for Best Historical Fiction, English in the 2016 International Latino Book Awards. A Decent Woman was Book of the Month with Las Comadres and Friends National Latino Book Club. Mark your calendars! Eleanor is one of many featured authors at 2016 Fourth Annual Chocolate Fest and Book Faire in downtown Martinsburg, West Virginia. She will be signing copies of her book, ‘A Decent Woman’ at Casa Visone Italian Restaurant, 120 N. Queen Street, Martinsburg, WV 25401. Indulge the mind and the senses at the Fourth Annual Chocolate Fest and Book Faire held in the historic downtown Martinsburg on April 22-23 2016. This event is sponsored by Main Street Martinsburg and Blue Ridge Technical and Community College. On Saturday, April 23th, come experience a one day chocolate extravaganza held in downtown Martinsburg. Taste some wonderful chocolate, indulge yourself in an array of chocolate creations throughout the businesses in downtown Martinsburg, explore the unique shops and speak with West Virginia authors. The festival features local and out of state authors signing their books within the businesses. There are over 20 businesses preparing a different chocolate item for you to enjoy on the Chocolate Walk. Mark your calendars! Eleanor is a Festival Author at this year’s West Virginia Book Festival happening over two special days in October as part of Charleston’s FestivALL Fall celebration. Be sure to keep an eye on this schedule to make sure you don’t miss anything! The Festival will take place at the Charleston Civic Center, Charleston, West Virginia. Jack has brought to the network Eleanor Parker Sapia, a Puerto Rican-born novelist, poet, and artist,raised in the United States, Puerto Rico, and Europe. Her life experiences as a counselor,alternative health practitioner, Spanish language social worker, and refugee case worker inspire her passion for writing. 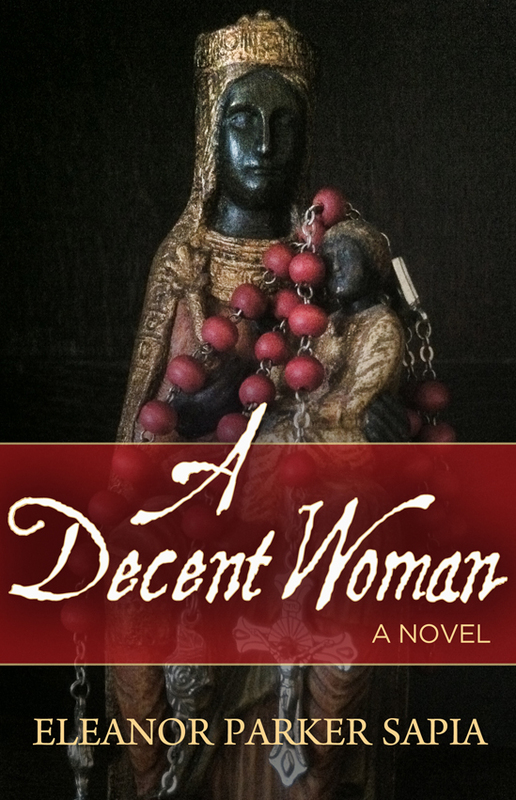 July 27, 2015 – A Decent Woman is the Book of the Month for July 2015 – Las Comadres & Friends Latino Book Club. Register for the teleconference on Monday, July 27 below! I look forward to answering your questions! Eleanor is participating in this incredible book festival located at the Gaithersburg, Maryland City Hall Grounds. Eleanor will be participating in the Book Faire with an author spot at Dolly’s Bake Shoppe on Queen Street. Come out for some great chocolate and meet the authors set up inside and outside of local businesses on Queen Street! Hosted by Main Street Martinsburg.